International Business Machines (IBM) posted a big gain after its earnings on Tuesday were touted as the best in years. Shares leapt 8.46% on the day, marking the biggest earnings day gain since September 2017 as the company's cloud, blockchain, and artificial intelligence initiatives bade bulls to buy into the stock and its high-tech turnaround ambitions. "While I've had my doubts about IBM for a while, I'm beginning to believe in the turnaround story here," Real Money contributor Tim Collins commented in his column on Wednesday. "One quarter doesn't make it so, but it does warrant attention." The quarter was certainly one to remember according to Morgan Stanley analyst Katy Huberty. The Armonk, New York-based tech titan's report of $4.87 in earnings per share was actually down 5% from the same period a year ago, but came in above FactSet consensus of $4.82 per share. Revenue also fell year over year to $21.76 billion, but again came in above the tempered analyst expectation of $21.72 billion. More positively still, which Huberty latched onto, the company forecast "at least" $13.90 in earnings per share and $12 billion in free cash flow for 2019, which comes in above expectations on earnings and in line with cash flow forecasts. 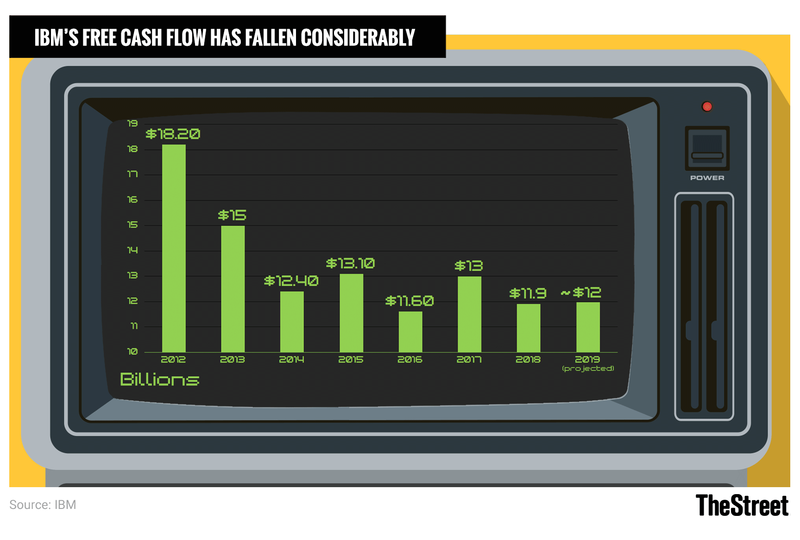 The steady cash flow forecast is an important one, as cash flow has been an area of concern given the company's heavy dividend focus and its recent $34 billion blockbuster deal for Red Hat (RHT) . In the longer run, the deal may cause issues like its culling of share repurchases and its pressure on the company's much protected dividend under its debt load. More positively, the company did work to expand its margins specifically in its hulking cognitive solutions unit, adding shine to the "clean quarter" and suggesting realizable growth outside of the broader secular shifts. The company's bullish calls on its hybrid cloud business, which will likely be bolstered by Red Hat before year end, have also begun to materialize. The company has recently inked partnerships with Juniper Networks (JNPR) , BNP Paribas (BNPQY) , Vodafone Group (VOD) , the Bank of the Philippines, and Walmart (WMT) , which suggests that a strong pipeline of cloud companions is available, especially as Red Hat joins the Big Blue fold. The company declined to elaborate much on how Red Hat might accelerate this pipeline given its second half of 2019 expected closing date, but its VP of ecosystem Chris Wong told Realm Money it will paly a pivotal part, especially in ecommerce. "We can create solutions for consumers based on what they are looking for," he explained. "A store next to a college versus next to a retirement home will be different and have different needs. This is one of the key reasons that IBM acquired Red Hat; to accelerate the multi-cloud solutions that allow flexibility to meet hyperlocal consumer demand." The commerce segment will be particularly beneficial as it will likely not see any competition from cloud king Amazon (AMZN) , that is not well liked among retailers. The story will need the shot in the arm, as cloud growth slowed to just 12% for the year 2018, a far cry from Microsoft (MSFT) Azure's 76% growth rate, which actually represented a slowdown in its own right. According to Synergy Research Group, IBM remains a distant third in the cloud race behind Amazon and Microsoft, while Alphabet's (GOOGL) Google cloud offering is neck and neck for the bronze. Microsoft and Amazon together control about 50% of global cloud market share at year end 2018 with each increasing market share into the end of the year. Meanwhile, IBM's market share dropped slightly and is threatened by the ascendant Alibaba (BABA) and Oracle (ORCL) globally for its ranking. The acceleration that Red Hat could stoke will be a welcome one and could add to the growth prospects for the low PE tech name. This thesis was convincing enough for Stifel analyst David Grossman, who advised a "Buy" rating on the stock. At the very least, the acquisition opens IBM's corporate face to an ecosystem of developers it will need to compete in the cloud. "Another reason why this combination works so well for Red Hat is IBM's long history and commitment and participation in open source communities and a focus on the developer ecosystem," Red Hat CEO James Whitehurst told analysts after the acquisition announcement. "We believe together that we can be the world's most powerful advocate for open source development." An ecosystem is a familiar word for the developer community, which through its democratized nature has the power to make or break companies. Nels Wangensteen, managing partner and portfolio manager at Maytech Global Investments, an investment advisor and asset manager that oversees $179.1 million in assets told Real Money that popularity with developers is of paramount importance. "You need to think of these companies as ecosystems," he said in an interview after the acquisition. "They need a huge developer community behind them." Thus, the company's decision to "maintain Red Hat's open source innovation legacy, scaling its vast technology portfolio and empowering its widespread developer community" might prove a vital concession to many apprehensive Red Hat employees and keep them onboard to keep the company's cloud aspirations attainable. The efforts in supply chain solutions with blockchain specifically, which were recently highlighted by IBM's partnership with Ford (F) to track cobalt sourcing and Walmart to track food supply chain, indicate that some of the biggest players in the retail and automotive spaces are certainly buying into this vision. IBM still has a long road ahead of it, but the clean quarter is a solid kickoff to the year for a company that has been trying desperately to orient its turnaround story to the new age cloud, blockchain, and AI narratives and away from the old image it built over the past 107 years. "IBM is an inexpensive stock," Jim Cramer commented on the floor of the NYSE on Wednesday morning. "I like what I see in IBM." He highlighted the bounceback from the company's poor third quarter and advised investors take a longer-term view as the Red Hat integration develops further. "Fool me once, fool me twice, you know. The third quarter had some weak numbers when it came to the strategic imperatives, but the fourth quarter brought them all back," Cramer said. "They told you: don't make 90 days be the judgment and they were right. I was very cheered by IBM...it shouldn't have been where it was." Real Money technical analyst Bruce Kamich added that shares could move further from where it was in the coming weeks as well, as he advised traders looking to get involved to buy as shares could quickly run into the $150 plus range after the solid gain on the day. Shares remain positive as post-market trading commences.